My mother passed away about 6 years ago. About 5 years ago my Dad got a computer so he could email me and my brothers and "keep in touch". He would occasionally forward me an email that told him he won huge sums of money either in Euro's or USD or some great prize. They were so compelling, he was 'sure' he had won. Of course I would tell him these are all scams or phishing emails and after some convincing on my part, he would finally delete the email. My Dad turned 87 last April and whenever we visited him we would notice that his dining room table was covered in letters from companies 'shouting' out to him that he had won $30,000 or $100,000 or millions of dollars or a new Ford Mustang Convertible car or trip or holiday etc. All he had to do was send $25 or $50 or similar amounts as a "processing fee" or "administration fee" or some type of fee to hold his winnings or begin the process. We would ask him about the letters, but he assured us that they were just junk mail and that he only liked to read them and would eventually throw them out. We did not know the extent to which my Dad was answering these letters and sending cash or cheques in the mail until we finally gained access to his bank accounts. He had sent hundreds of letters back to these people and had written more than 100 cheques and paid out probably $1000's of dollars and maybe more than $10,000 to these scammers. We have no idea of the total amount he got tricked into sending to these fraudsters. Very recently, we found out that my father has progressive Alzheimer's and we've moved him into a long term care facility. We never knew that answering these letters gave my father something to do and gave him false hope that he would receive the money or prizes. These letters with their promises became my Dad's new reality. When we cleaned out my Dad's apartment, in many of his drawers and "private" storage areas we found many pieces of fake ruby jewels with fake gold chains inside cheesy red velvet (plastic) bags. He had paid $20, $30 or even $50 for some of these pieces of junk. Good grief! He never told any of us about this world he was participating in. We had his mail forwarded to my home address in late December 2012 and my wife and I have been receiving and opening his mail for about a month now. Some days we receive only 2 or 3 pieces of junk/scam mail addressed to my Dad. Other days there were 10 to 15 or even more pieces of mail on one day! 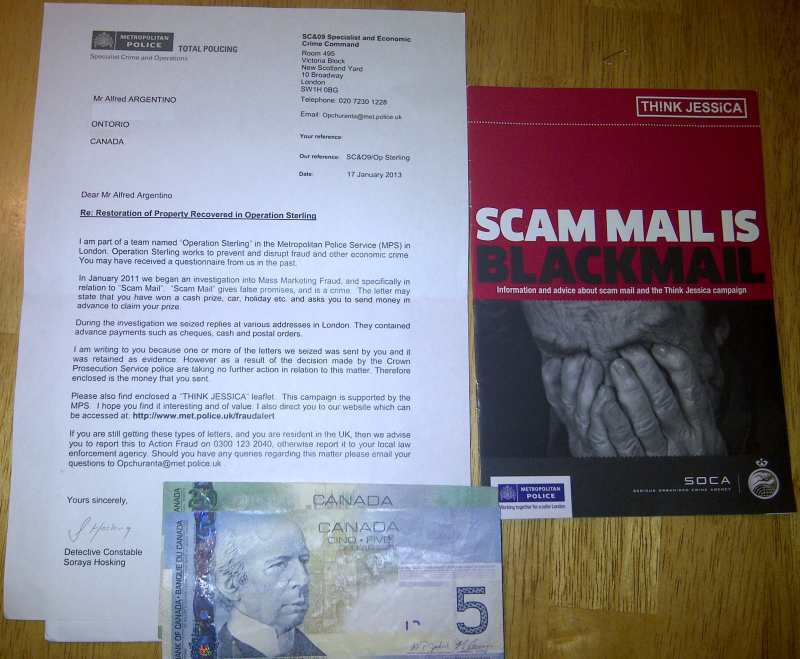 It's absolutely shocking the amount of "scam mail" he receives that claims he has won lotteries, prizes, trips and more. Once an unsuspecting person sends payment to these scammers, they sell the list of 'suckers' to other scammers and it snowballs. These are all fraudulent scammers from all over the world. Some of these letters are from the Netherlands, others from Hong Kong, The Middle East and parts of Africa. These countries must have loose mail fraud laws or maybe inexpensive mailing costs. Very little of these letters originate from Canada or the USA. Yesterday, we received a piece of mail from the New Scotland Yard Metropolitan Police Department in the UK! See a copy of the letter below. My Dad had sent money to one of these Mass Mail Marketing Fraudsters and the police in the UK were intercepting payments sent by unsuspecting people like my Dad and retaining the letters and payments as evidence in their investigation. The letter from the police indicates that they are no longer taking action with this matter and they returned my Dad's $25 cash he had sent in the mail. Wow! What a world we live in. Also, along with the letter to my Dad, the police from Scotland Yard included a brochure containing information and advice about scam mail and a campaign they have in the UK called Think Jessica The statistics are astounding. Mail scams in the UK cost consumers about 3.5 billion pounds per year! You can read more at this link about Think Jessica. I'm posting this on my blog because many of my clients and friends are about my age and have parents or family that are in their 70's or 80's and they are most susceptible to these types of crimes. If you see a pile of letters sitting on your families table, ask many questions about what they are doing with the letters and try to help them avoid being scammed by these fraudsters like my Dad was! "Following an estimated 1.9 per cent in 2012, the Canadian economy is expected to grow by 2.0 per cent in 2013 and 2.7 per cent in 2014, and to reach full capacity in the second half of 2014, later than anticipated in the October Report." This indicates that as long at the economy in Canada and globally continues as it is, we can probably expect that interest rates will remain at about 1% well into 2014. This is good news for people who need to borrow. What are Special Assessments on condominium properties? A special assessment is an additional payment or a levy that a condo board has to impose when unexpected shortfalls or unexpected expenditures occur in the budget, or when an expensive system has to be replaced (i.e., windows, mechanicals) and there is not enough money in the reserve fund to cover for it. Special assessments often occur in condos that were built before 2001, when reserve fund studies were not mandated by the previous Condo Act. As a result, developers and boards failed to build up sufficient reserve funds for future replacements. The fact that the owners have paid this already means that you will not have to assume the additional payments when purchasing this condo, which is great. Buying a condo townhome is the same risk as buying a condo apartment - anytime you buy a condo you are becoming responsible for the debt of the condo (shared with the other owners). Condo townhomes are less likely to have special assessments as there are not as many expenses due to less amenities in the building. As an agent, we ensure to request a status certificate that your lawyer would review to make sure the reserve fund of the condo is in good standing and has sufficient money. If you have any further questions or would like to view this condo please let me know. Greater Toronto Area REALTORS® reported 3,690 sales through the TorontoMLS system in December 2012 – down from 4,585 sales in December 2011. Total sales for 2012 amounted to 85,731 – down from 89,096 transactions in 2011. “The number of transactions in 2012 was quite strong from a historic perspective. We saw strong year-over-year growth in sales in the first half of the year, but this growth was more than offset by sales declines in the second half. Stricter mortgage lending guidelines resulted in some households postponing their purchase of a home. In the City of Toronto, the dip in sales was compounded by the additional Land Transfer Tax, which buyers must pay upfront,” said Toronto Real Estate Board (TREB) President Ann Hannah. The average selling price in December 2012 was up by 6.5 per cent year-overyearto $478,739. The average selling price for 2012 as a whole was up by almost seven per cent to $497,298. “Robust annual rates of price growth were reported through most months of 2012. Price growth was strongest for low-rise homes, including singles, semis and townhouses. Despite a dip in sales, market conditions remained tight for these home types with substantial competition between buyers,” said TREB’s Senior Manager of Market Analysis Jason Mercer.